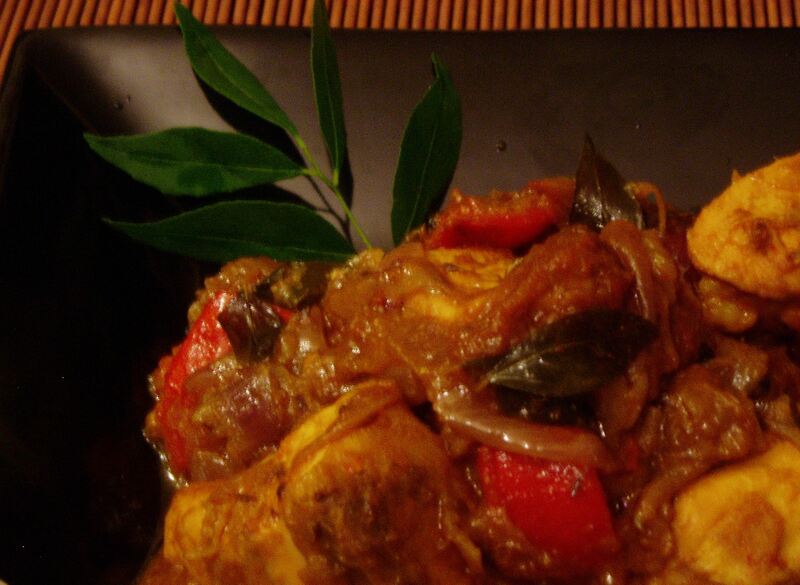 I remember eating this unforgettable and distinct curry leaf flavored chicken at a restaurant in India a very long time ago. I also remember suggesting it to my mother and sister both of whom were very skeptical about how well curry leaves and chicken would mix. So it remained long forgotten until a couple of years ago when a curry leaf craving struck me. It was one of those times when I hadn’t made it to the Indian grocery for a few weeks in a row and my kitchen was running low on a few things. I started to crave something, well just about anything cooked with curry leaves and red onions neither of which I had on hand. In under 48 hours I stocked up on my precious fresh curry leaves and took a stab at making something that resembled the chicken I’d eaten at least over 10 years ago. It turned out well and has become one of my chicken staples. If you’ve never tasted food seasoned with fresh curry leaves you are missing out on a singularly flavorful and unforgettable herb. If you have, then you are nodding and smacking your lips. Curry leaves are not easy to find, I’ve seen them no more than a couple of times at the Dekalb International Farmer’s Market here in Atlanta but you can always find some in the produce section of most Indian or South Asian grocery stores. The flavor of fresh curry leaves is quite distinct and different from that of dried curry leaves so I wouldn’t recommend substituting as readily as I would with some other herbs. My family has chowed down about as much of every kind of lentil as any lentil loving Indian family and we do love our lentils. However, the yummy green bean, aka Mung or Moong, never snagged a starring role in my mom’s kitchen. 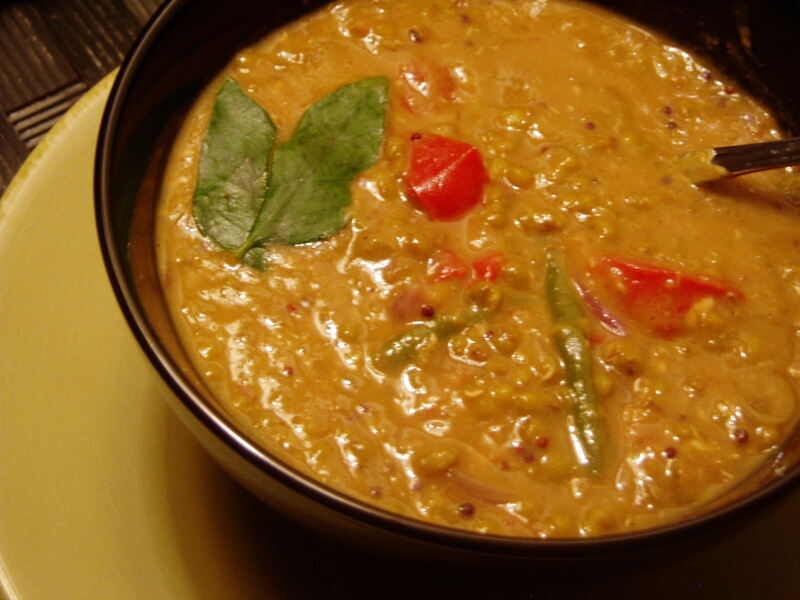 While it put in an occasional appearance as “Sundal” (pronounced Soondal – a dish for another post) it almost never got to play its most popular role as the light and healthy yet sumptuous and filling Mung Daal a type of lentil curry. Now as producer and director of the show called “In My Kitchen” I call the shots and the good green bean has landed a recurring and piping hot part. 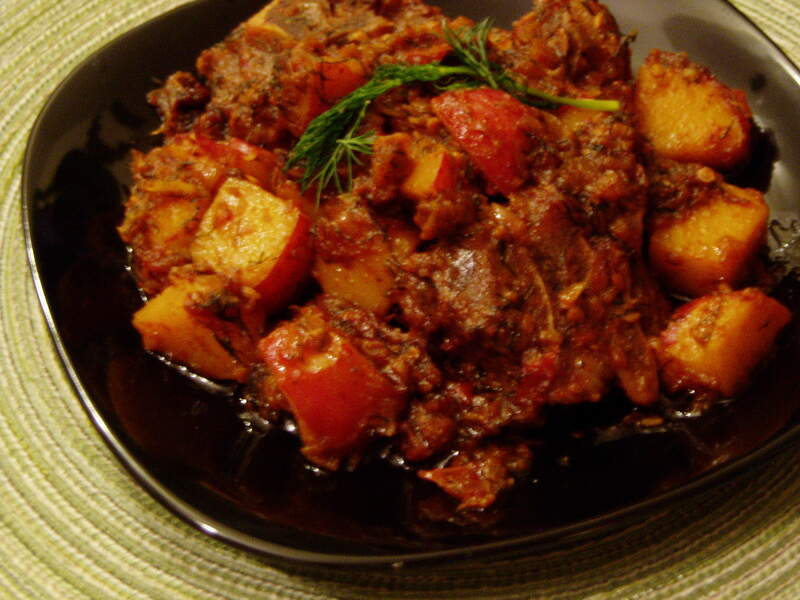 A steaming bowl of this delicious stuff hits just right note of warmth and comfort on a cold November evening.